Less than 48 hours after the nation collectively chanted “USA!” for the national soccer team in the World Cup last week, a much smaller group of Americans in Murrieta, California, used the exhortation for a very different purpose. Carrying homemade signs reading, “Return to sender,” “Save our children from diseases,” and “Bus illegal children to White House,” protesters used the slogan to turn back busloads of youthful arrivals from Central America destined for a new detention center in their community. The two moments project what I believe is the Janus face of American patriotism: one celebrating our never-die spirit, the other revealing the dark current of xenophobia. The upsurge of 240,000 migrants in recent months, 52,000 of them unaccompanied minors, has unleashed the same arguments we’ve witnessed in the endless debates about immigration. But once we consider the twin questions of “why is this happening?” and “how should we respond?”, it becomes clear that the current crisis is more of a humanitarian one than it is another chapter in our immigration debates. The fact that many migrants have come from three countries—Honduras, El Salvador, and Guatemala—suggest that something is wrong there. Although critics of these refugees hate to admit it, the crisis exposes a legacy of flawed American policies in the region: from the CIA-inspired coup d’état in Guatemala (1954) and bribes of Honduran officials to suppress export taxes on bananas by U.S. agricultural conglomerate United Fruit (in the late 1960s and through the mid-1970s) to the U.S.-financed contra war in Nicaragua that consumed its neighbors and the CIA involvement in Guatemala’s civil war (the 1980s). The current instability can more precisely be tracked to the recent drug wars in Latin America and the failure of U.S. immigration policy. Drug cartels filled the vacuum of governance created by suppressed democracy and arrested economic development in these countries. Members of these crime syndicates now rule the streets and carry out threats of murder against young people and their families if they don’t cooperate. U.S. drug consumption is the fuel that drives this not-so-underground economic engine. That one of the most murderous crime syndicates, Mara Salvatrucha, was born and raised in Los Angeles is a testament to the direct connection between failed U.S. drug enforcement policies and violence in the region today. And then, instead of addressing the drug, immigration, and economic challenges at home and abroad, Washington passed the Illegal Immigration Reform and Immigrant Responsibility Act in 1996. This punitive legislation led to the deportation of many Salvadoran gang members, who became the shock troops of a new, more violent Central America. More recently, Salvadoran journalist Óscar Martínez accompanied minors on the train eight times and wrote a series of graphic and deeply disturbing reports for an online newspaper, ElFaro.net. These reports have since been assembled into a book and translated into English as The Beast. Documenting harrowing accounts of sacrifice and heartbreak, Martínez’s reporting reveals the unambiguous reason why migrants have been risking their lives to make the trip: the vast majority of these migrants are fleeing real threats of violence and death at home. Forget about the pursuit of the American dream, an American education, or an American job. They are simply trying to stay alive. To blame the victims in this situation is not only dishonest; it is cruel and inconsistent with our nation’s promise to welcome the “tired” and “poor” of other countries, especially from hemispheric neighbors who are coping with conditions that are partially of our making. The accusation waged by many protesters that youthful migrants are diseased, and therefore, not “fit to be citizens” is a well-worn and specious claim that has been used against Asian and Latino immigrants for as long as they have been coming to our shores and through our borders. We need to strike a different chord, check such racist assumptions, and see the humanity in the people who are now coming to us in desperation. In the face of such trauma, we need to treat these new arrivals as what they really are—refugees, not voluntary migrants. According to the 1951 United Nations Convention on the status of refugees, a refugee is “someone who is unable or unwilling to return to their country of origin owing to a well-founded fear of being persecuted for reasons of race, religion, nationality, membership of a particular social group, or political opinion.” U.S. immigration policy—broken as it is—still maintains “temporary protected status” that should be extended to these migrants. Under such protection, a migrant is allowed to stay in the country for a year and a half, and have his or her case re-evaluated annually. It isn’t yet clear what President Obama will do about this humanitarian crisis, and about the children themselves. He said Wednesday in Texas that this is a real “problem,” not political “theater” and is calling for more resources to secure the border. But the president hasn’t ruled out deporting many of these immigrants, in what would amount to another attempt to convince the American public that he can be both tough on border crossers and sympathetic to immigration reform. Such actions would be consistent with his unprecedented number of deportations to date. 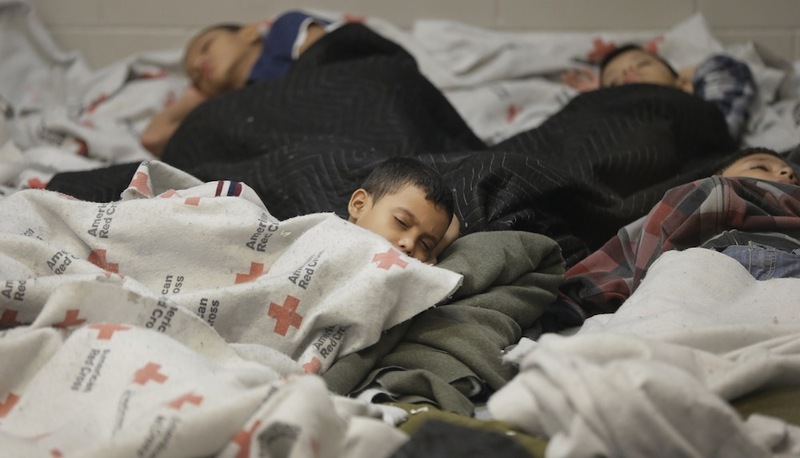 Playing politics with the fate of these children is inexcusable—doing so when immigration reform is dead in Congress anyway makes little sense, even from a cynical, Washington-centric perspective. The sooner all Americans recognize that this is a humanitarian crisis and not fodder for tired old political debates, the sooner we can do the right thing and begin to reclaim the real meaning of “USA!” as it reverberates throughout the world and in our hemisphere. Matt Garcia is the director of the School of Historical, Philosophical, and Religious Studies at Arizona State University. His most recent book, From the Jaws of Victory: The Triumph and Tragedy of Cesar Chavez and the Farm Worker Movement (University of California Press), won the Philip Taft Award for the Best Book in Labor History, 2013. *Photo courtesy of REUTERS/Eric Gay/Pool.